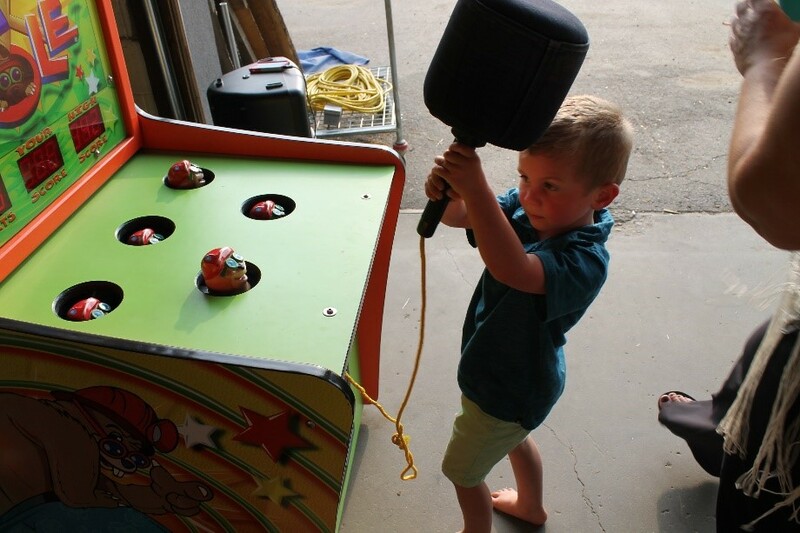 Years ago when I went to Lakeside Amusement Park, I played a game called Whac-A-Mole. If you ever experienced it, you remember that you hit the mole that pops up and pound it back into its hole. As soon as you knock a mole back in its hole, another pops ups for you to hit. And so it goes until you tire, or the time to play runs out. As you may have guessed, the mole always wins. So let’s play Whac-A-Mole (“WACK”) with the environment and see what that gets us. You know the environment because you live in it every day. But you have concerns that it is changing for the worse, and you want to do something about it. If you are a car nut like me, you might be wondering what can be done with cars to make the environment better. This discussion, debate and hand wringing has been going on for a long time. There have been lots of laws, regulations and changes in the cars that we drive. The hot ticket now is fully electric cars with “zero emissions.” Let’s play Whac-A-Mole with that concept. To start, I will do some “back of the envelope” calculations (You know the calculations you do during happy hour at the bar…). The idea is not to get a truly accurate answer, but just to get an order of magnitude calculation that helps define the nature of the problem. To keep it in the spirit of this method, I will do it on the back of my Xcel Energy bill return envelope. Colorado has 5 million registered vehicles. Assume that 2 million of them are Tesla Model 3 cars or the equivalent in energy consumption. Tesla will soon be a minor supplier as the major car companies, including Ford, GM and VW, enter the market. Wow – a battery-powered Lincoln Continental! That would be hot. It takes 32 amps for 12 hours on a 220 volt charger to recharge a Tesla Model 3 to full capacity. Let’s say that this is done once every four days. That is about 85 kilowatt hours times 2M/4 (500,000 charges each day). Maybe if roofs are plastered with solar cells, AND you pray that the sun shines, AND you can afford storage for night time release of power, THEN YOU ARE ALL SET. Let’s hope there are no big hail stones to spoil the fun! The Chinese are currently doing population control using Death By Asphyxiation (DBA) due to air pollution in the large cities. They are being forced to go electric with their transportation or die. I think they are currently the world’s largest producer of solar cells and are buying up the world’s source of lithium as a state sponsored commodity hedge. They have the world’s largest lithium ion battery factory. I believe Elton Musk’s gigantic battery factory in Nevada has off the grid solar homes as its principal target. Without storage, the electric energy solar cells are not practical for a constant supply of energy. So we Whac-A-Mole and generate pollution by manufacturing massive quantities of batteries.Then we Whac-A-Mole and generate radioactive waste with nuclear power. With a big thump, we Whac-A-Mole drilling 30 thousand fracking holes to get gas and crude oil. We Whac-A-Mole to put up ugly windmills that makes pate out of birds and require a massive increase in transmission lines that currently do not exist. We Whac-A-Mole to cover the ground and our roofs with blankets of solar panels. And so it goes on and on . . . 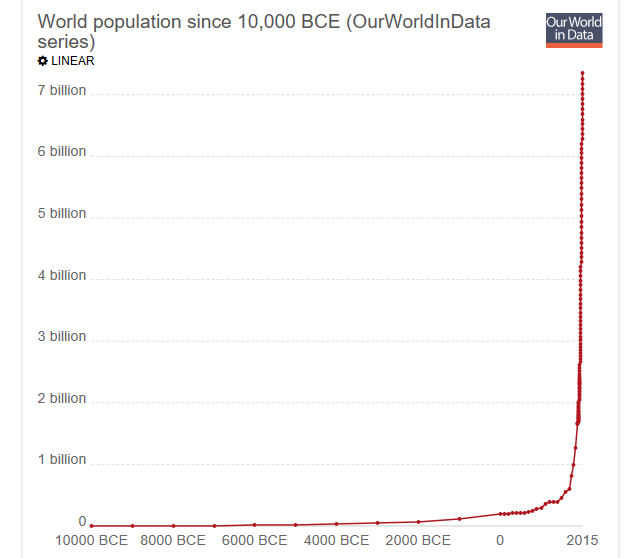 If you stop doing Whac-A-Mole and look at the real cause of environmental problems, you come to the conclusion that there are too many of “us.” For me, graphs are like a musical score to a musician. Musicians look at what is essentially a graphical representation of music and can imagine the sound. I look at data on graphs and can imagine the problem. If that “hockey stick” graph above doesn’t scare you, it does me (“Waiter, please bring another round and make them doubles.”) You see with our Whac-A-Mole environmental solutions we are just in the midst of fighting a losing battle. Nothing goes to infinity, but data does go to boundary conditions, and they are not nice for the “hockey stick.” In viewing the above graph, I just see the problem. Are you able to see a solution? I have enough biology education to know that if humans cannot solve the problem, Mother Nature will. She can be one bad mother too! So what to do? 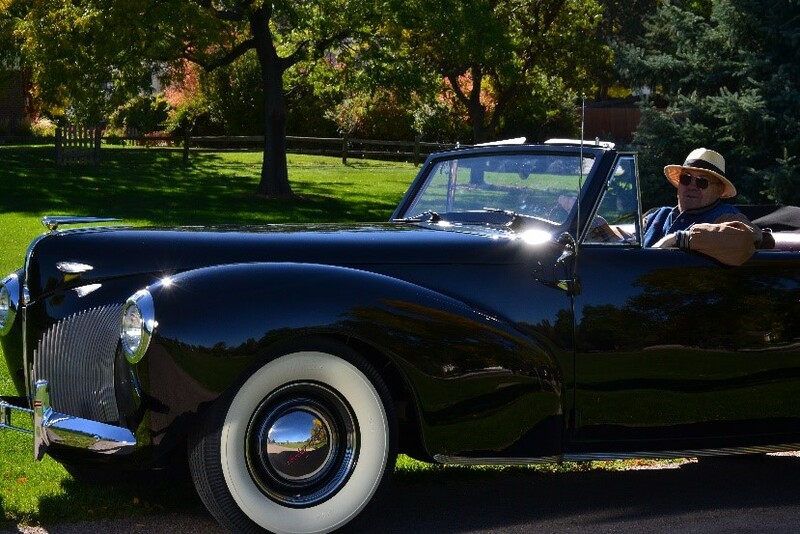 I think I will just put the top down on my 1940 Continental on the first warm day and go for a drive. Care to join me? 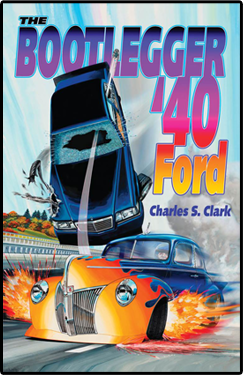 This article was published in Bootlegger Book Blog and tagged Charles Clark, hot rodders, hot rods.